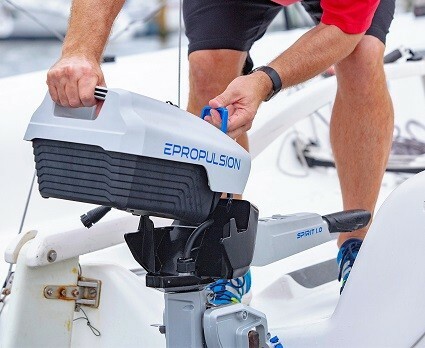 – NOISE, The Torqeedo is quiet compared to a petrol outboard, but the Epropulsion seems noticeably quieter than the Torqeedo 1003. This is because the Torqeedo 1003 has a small, fast-spinning motor driving the propeller through a reduction gearbox, while the Epropulsion has a larger, direct-drive motor (no gearbox). The Torqeedo 1003 solution is lighter, but the Epropulsion mechanically more simple. The loudest part (ie what you hear) of the Torqeedo 1003 is that reduction gearbox, and it’s widely described as a “whine”. To our ears at least the Epropulsion is more pleasant to listen to and generally sounds more “refined” (if there’s any wind or waves, it’s all-but silent). There is a video (not ours) of both here: Torqeedo & ePropulsion sound test UPDATE: We have yet to put them next to each other (don’t worry, we will!) but apparently the new direct drive Torqeedo 1103 is even quieter than the Spirit. – (A bit) HEAVIER. The Torqeedo 1003C (with 915Wh battery) weighs 14.9kg, the more directly comparable new Torqeedo 1103 C (also 915Wh battery) weighs 17.3kg, and the ePropulsion Spirit (1018Wh battery) weighs 18.6kg. However the story changes slightly with batteries removed – what we call the irreducible weight – as the new 1103 motor/shaft weight is 11.3kg vs the Spirit’s 10.8kg (and the 1003’s 8.9kg). – FLOATING BATTERY. 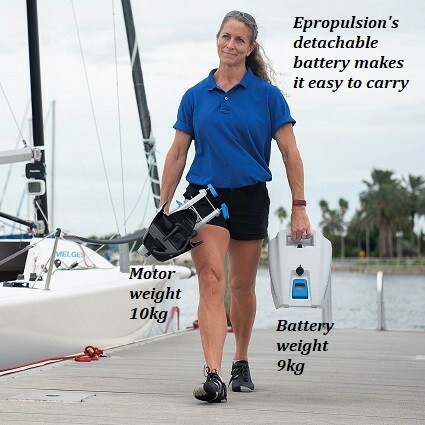 The E-Propulsion battery is physically larger, partly because it houses a battery with 10% more capacity (1018Wh vs 915Wh for Torqeedo), and partly because it encloses enough air for it to float if accidentally dropped. We have tried it, and it does float. The Torqeedo batteries do not float, nor are they claimed to; we have not tried that ourselves but unfortunately (for them, and their wallets!) some of our customers have… it’s an expensive mistake to make! – FASTER CHARGE TIME. From flat, with the mains chargers supplied: the Torqeedo 915Wh battery charges in about 10 hours; the Epropulsion 1018Wh in about 5.5hrs. There is also a Fast Charger option on the Epropulsion, which reduces charge time from flat to about 2.5hrs (take it to the pub with you, it will be fully recharged by the time you’ve eaten and had a couple of drinks). Both also have the option of using 12V DC chargers. – The Eprop’s tiller is folding rather than removable, which also means there’s only one cable to connect/disconnect (compared with the Torqeedo’s two cables). But it does mean the dismantled Torqeedos are slightly smaller to store. – The Eprop does not have GPS, so it does not have a readout for speed and range (the Torqeedo does). However both motors do tell you how much battery is left, which seems to be the bit people find most useful on the Torqeedo LCD. – The EProp has a bit more range. We haven’t done that much in the way of truly fair testing (identical boats, identical conditions, identical battery charge states) but so far there doesn’t seem to be much in it on top speed. That was on a lake, on a small RIB, flat calm. At half power the EProp is possibly slightly faster than the Torqeedo, and (from a customer with a Drascombe Lugger) it looks like the difference might be more in favour of the Eprop on heavier boats. These differences are most likely due to propeller characteristics. If you conclude “there’s really not much difference” then as the Eprop battery also has 10% more capacity than the largest Torqeedo battery, this means the Eprop will take you about 10% further, at the same speed. In more general terms on a typical dinghy both will run for about an hour flat out (at roughly 6 knots, giving a range of approx 6 nautical miles) or two hours at half power (5 knots, 10nm). – Eprop only has one battery option. The Torqeedo can be purchased with 532 or 915Wh batteries, the EProp only comes with a 1018Wh battery. – The “Remote” options. (May be significant if you want to use the motor on different boats.) 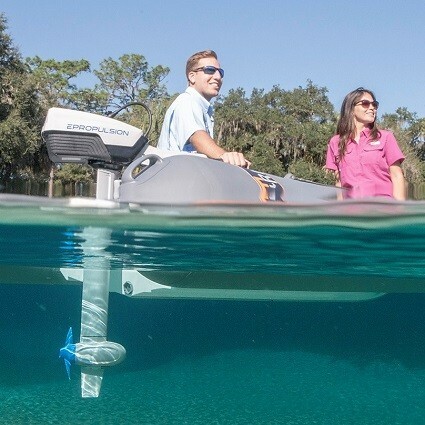 The Torqeedo remote is wired, and interchangeable with the tiller. You buy the tiller version and then add the remote control if you want one. On the Epropulsion the tiller (hard-wired) and remote (wireless) are not interchangeable, you have to choose one or the other when you buy it (and you can’t later use a remote with a tiller model, nor vice versa). BUT the remote version of the Epropulsion is compatible with standard steering gear, and the Torqeedo isn’t. On both brands you can lock the steering and use the boat’s rudder, but if you want to steer the Torqeedo directly you have to invent something. – At full power, the two motors are roughly the same in terms of speed (~6 knots on a dinghy) so the range of the Epropulsion is about 10% more than the Torqeedo simply because the battery has more capacity. At full power the Torqeedo 1003C (with 915Wh battery) will run 55 minutes giving a range of 5.5 miles; whilst the Epropulsion Spirit will run for an hour giving a range of 6 miles. The new Torqeedo 1103 is 1100W rather than 1000W but they make no claim for higher speeds; flat out the 1103 will run for 50 minutes. – At half power you should get more like 10 nautical miles from either of the Torqeedos. 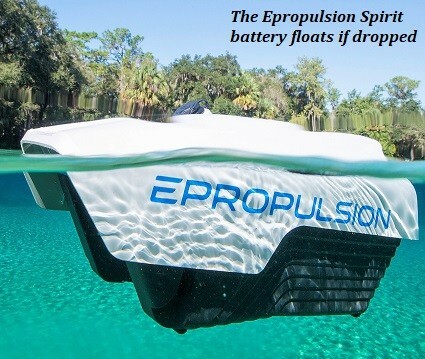 If our finding is correct, that the Eprop is slightly faster at half power than the Torqeedo, then this, combined with the larger battery capacity, would indicate a range of 11-12 nautical miles for the Eprop. – The range/run-time will increase further as you slow down more, but since 10 nautical miles is already far more than most people ever need from a small outboard motor we haven’t really bothered testing it. Torqeedo claim 35 miles at 2 knots (for their 915Wh battery); we don’t want to sit in a boat going at 2 knots for 17 hours to prove or disprove it! SHAFT LENGTH – S, L, or XS? Both the Epropulsion and the Torqeedo spin much larger propellers, more slowly, than comparable petrol outboards. This makes more efficient use of the high torque characteristics of electric motors. BUT a large propeller is only more efficient if it’s actually underwater, and that means the shafts have to be a bit longer. So the “S” shaft electric motors are almost the same length as an “L” shaft petrol motor. 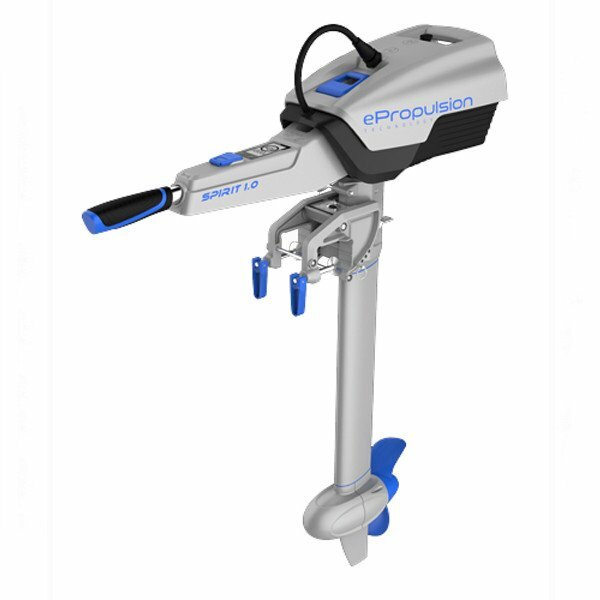 However on many small boats these “S” shaft electric outboards stick down rather deeper than necessary – which is inconvenient when coming into a beach or slipway – so Epropulsion now also make an “XS” (Extra Short) model. This is roughly equivalent to a petrol “S” shaft and immerses the propeller deep enough on nearly all the boats we sell including SpearFish, F-RIB, Nautiraid Coracles, Nestaways, DinghyGo. XS is the most suitable length for almost all small inflatable dinghies on the market (up to about 4m long). For most applications – for example a motor on the back of a dinghy – this is not important. But if you’re planning to put your motor in a dinghy, dayboat, or small yacht’s “well” – often with a marginal entry/exit slot – it might be. 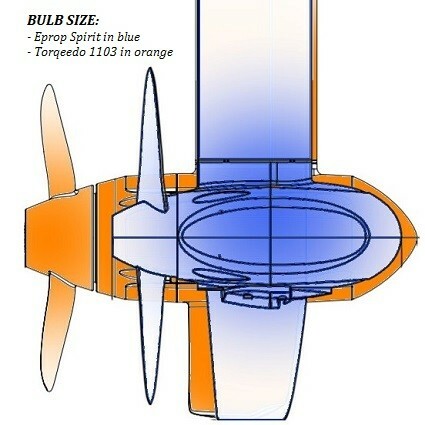 The Torqeedo 1003 and Epropulsion Spirit (shown in blue) are similar but the new Torqeedo 1103 (orange) is quite a bit larger. The 1103 bulb is 323mm long with a diameter of 123mm, the Spirit bulb is 254mm long with a diameter of 108mm. We’re not sure why there’s such a difference – maybe because the 1103 has 10% more power – but it’s definitely there, and quite noticeable. Because of this it may also be less convenient to store the 1103 than the Spirit, in some situations. * 12V Charger. Because of the voltage at which the Spirit battery needs to charge, this is actually quite a sophisticated DC-DC “step-up” charger and current controller, hence the additional cost compared to the Torqeedo 12V charging cable (which is effectively a piece of cable with the right connectors on both ends). This means the Epropulsion can also be connected directly to most solar panels, ie there is no need for any extra controllers or regulators in between, and you don’t have to use any particular make of solar panel. ** Fast Mains Charger. The price of both motors includes a standard mains charger but Epropulsion also offer a fast charger that reduces the charge time to 2.5 hrs from flat. As with all fast charging though, this benefit is not without cost. It does not “harm” the battery as such, but in terms of battery longevity is roughly equivalent to two cycles of charging at the standard speed. 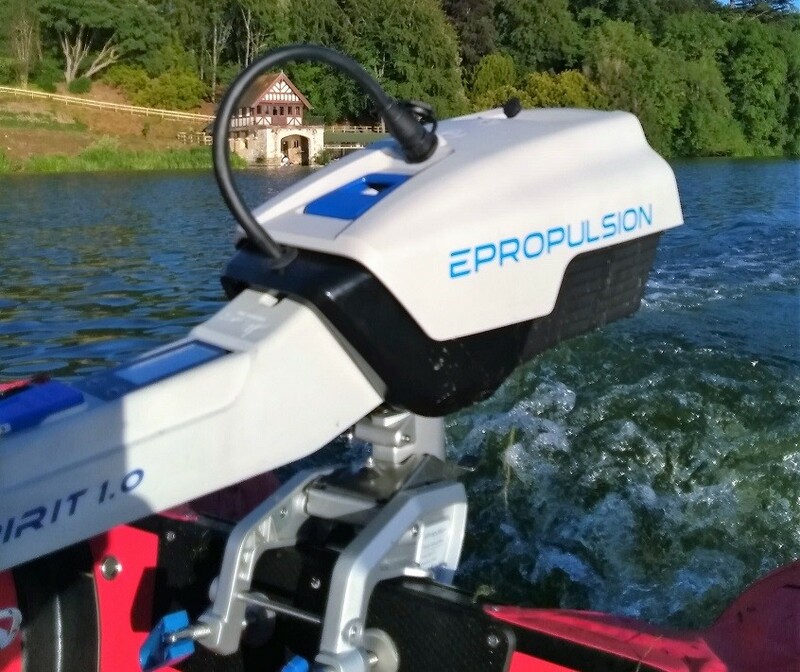 If you contact us you will be able to speak to somebody who has actually used both the ePropulsion and the Torqeedo on the water, and can give genuine, useful (realistic!) advice about battery life, range, and whether your particular boat is suited to electric drive. As of February 2019 we are still – to the best of our knowledge – the only UK Dealer to stock both makes. By that we don’t mean “we can get one if you really want us to”; we usually have both Torqeedo and Epropulsion motors available to see and buy. There are many similarities between the two, but also some important differences. We have seen and tried both, quite extensively, and it’s only by stocking both we believe we can listen to what you want and recommend the one that will suit you better (rather than being a single brand dealer and forced into trying to sell you that one…). We must emphasise, we have nothing against the Torqeedo 1003 – we’ve been selling them for nearly ten years, they are very good motors – nor the new Torqeedo 1103, but we really do feel it’s in our customers’ interests to be able to compare Torqeedo and Epropulsion directly next to each other, rather than at separate dealers perhaps 50 miles apart. If you would like to compare the two motors for yourself, we have both here, please come and see us.